Your lawn should be a place of play and relaxation, where your children’s imagination can flourish and their seemingly endless energy can be spent. While you want their imaginations running wild, you don’t want your lawn to go wild and create needless hazards or dangers for them and your pets when they do venture outdoors. As warmer weather approaches, it’s time to think about the things you can do to keep your yard safe. It’s not likely you’ll be able to remove all danger from your child’s path at all times, but taking a few precautions can ensure that certain accidents be avoided. As Forbes reports, parents often go to great detail to childproof the interior of the house, but the exterior can also pose dangers. Look for pointy objects or loose wires from fencing that might injure your child. Look for holes or big rocks that are hidden and can cause your child to trip. Make sure lawn tools are put away and locked. Aim for soft and cushioned play areas with grass and sand. Avoid pea gravel, as it can be a choking hazard and not the ideal surface for rolling and tumbling around. Avoid dangerous, toxic, or prickly plants like English ivy, poison oak, or morning glory. Using 10-20% vinegar: Go to a home maintenance store because regular vinegar from the grocery store will not do the trick. Then spray around as needed. Using BurnOut weed killer: This is a prepared mix of vinegar and clove oil. Pulling them out: To keep your yard chemical free for your pooch and children, you might have to put on some gloves and pull them out yourself. The Spruce reports of several backyard plants that are poisonous to dogs. These include English ivy, morning glory, lily of the valley, and foxglove. Trees and shrubs can improve the look of your lawn and home while providing a great hangout spot. Shrubs can bring a lawn together and add some beautiful flowers, colorful leaves, or berries. Trees have many benefits to our homes and neighborhoods. They provide shade, clean air, and a place to relax, but like shrubs, they also need care and attention. Keep your shrubs clean and trimmed to avoid pests and to maintain an orderly look. This also prevents hazardous branches or prickly plants from growing outward and posing danger. 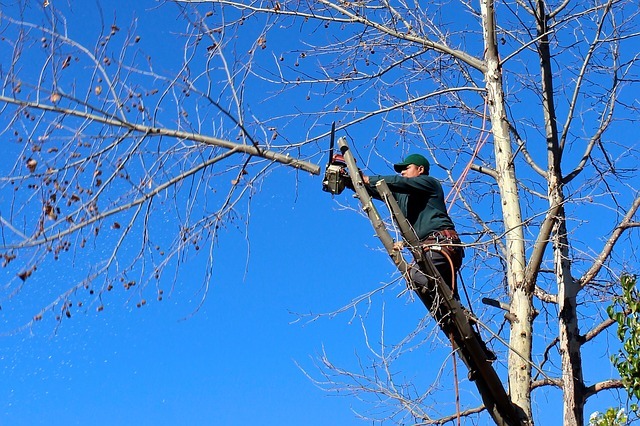 A dead or dying tree may ultimately have to be removed for health and safety purposes. Install and tighten railings and/or steps to help avoid injury. Handrails can assist children and seniors as they walk outside. Handrails loosen over time, so make sure to check and tighten them often to ensure they serve their purpose. Fence off your lawn. With children and dogs running around, you don’t want to worry about them going off into the street or traffic. Make sure you have a high and safe fence so you can keep an eye on them. As the warmer temperatures come, ensure your family is safe so that they can make the most of the outdoors. Use these tips to maintain and clear your trees when necessary and keep your lawn beautiful and safe for children and pets.